Shipping: US $30 Expedited shipping service(EMS) with north America. US $40 with east Asian, west Europe. US $50 with other area. 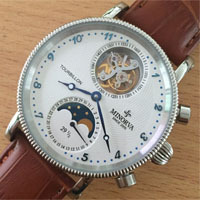 Dial : white dial marked "MINORVA"
Condition : 2 o''''''''clock button to adjust moonphase ,4 o''''''''clock button to adjust date ,New Condition & Keeping good time. US $10 Standard Flat Rate Shipping Service (Only delivery to USA/Russian/Australia/Canada/French/United Kingdom/Germany). the other area use EMS. US $30 Expedited shipping service(EMS) with north America. US $40 with east Asian, west Europe. US $50 with other area.